It has been envisioned that in order to develop a fairer and more egalitarian society comprising of well-balanced human beings, in addition to cognitive and analytical skills,adequate attention on activities like life skills, experiential learning,health and physical education, sports, visual and performing arts,literary & creative skills, and work based education are indispensable. Though the existing curriculum does incorporate these skills, however, the load of curriculum in cognitive and analytical area seems to be so heavy that students practically do not get much time to develop skills in other areas. 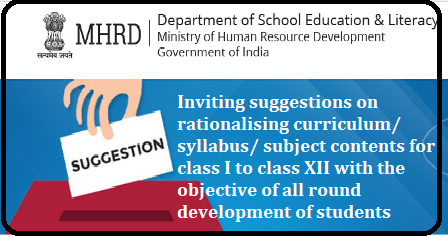 In order to balance the curriculum for cognitive and analytical areas with curriculum in other life skills including creativity and sports, specific suggestions are invited from teachers, academics, students, parents and other stakeholders associated with school education. The objective is to make the content more balanced in various subjects offered from class I to class XII as prescribed by NCERT/CBSE. Suggestions could be made latest by 30th April (Monday). It will be appreciated if suggestions are precise. It is assured that your personal details will remain confidential.